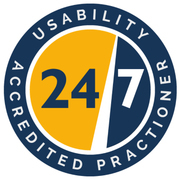 The Usability24/7 Accredited Practitioner badge is awarded to user experience professionals that have successfully completed our accreditation programme. The qualifying criteria includes qualifications, range of relevant skills, depth of skills, length of practical experience, and communication skills. Practitioners that have been accredited and awarded the badge may work on Usability24/7 projects and programmes.